1. Uphold strong competence in advocacy to maintain and advance existing business interests, while expanding the mandate of the function to look beyond the present challenges and dedicate at least an equal amount of resources to future opportunity creation . 3. Realign incentives around the width, the breadth, and the strength of partnerships that the corporate-affairs team has achieved in addition to the problems it helped solve. To leverage the value of network , which some experts anticipate to be an organizing principle of future economy, a corporation must first embed itself in such networks above and beyond commercial relationships. Beyond the practical consideration, perhaps an even greater impact can be generated as companies become more mission-driven . When social responsibility and value creation through partnership are intrinsic to corporate culture, the aforementioned adjustments might emerge organically and wouldn’t have to be mandated from the top. To gain a wider perspective on reinventing external affairs, it is worth considering the changing nature of competition. Enterprises have moved on from product differentiation and process optimization to customer-experience design . Going forward, the question of how corporations do things, rather than what it is that they do, will become increasingly important, according to Dov Seidman. In his book “ How ,” Mr. Seidman makes a compelling argument that the future of competition will be anchored in corporate behavior. He describes a world of totally transparent business affairs spurred on by the ubiquity of information. In this framework, proactive external stakeholder engagement is a ticket to sustainable competitive advantage. Doing well by doing good , as a core principle of business strategy, had worked for a precious few among the Fortune 500 companies so far. Nielsen – a marketing company that popularized this concept – predicts that doing good , henceforth, might become a prerequisite for doing well . 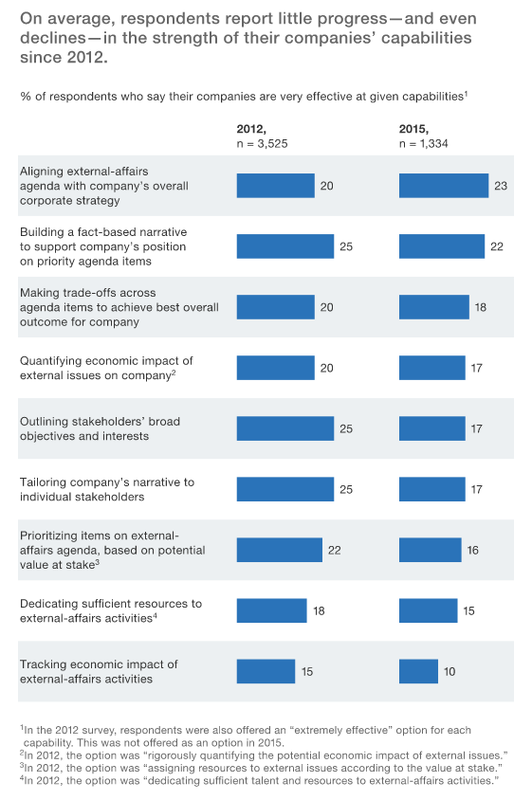 Here again, the external affairs departments are best positioned to lead the way and help corporations connect the synergy dots of public and private value creation.